Throughout Australia and New Zealand at this time of year, many of our clients contact MetroCount seeking quotes for traffic counting equipment to (a) utilise funds already allocated, or (b) use available funds possibly unused for other projects. At MetroCount, we understand that high quality, up-to-date traffic data is essential to secure adequate road funding. Do you have sufficient temporary or permanent traffic survey equipment? If not, please contact us. We will call you to discuss options and prepare a traffic survey package tailored to meet your needs. Our offers are usually valid for four weeks. However, if you require your quotation to be valid longer to enable time for approval, please don’t hesitate to ask. Our immensely popular MetroCount® 5600 Portable Vehicle Classifier.MetroCount’s 5600 Series Vehicle Classifier uses simple rubber pneumatic tube combined with sophisticated software to give traffic and municipal engineers unmatched versatility with invaluable road statistics. Exported to over 90 countries and with thousands of units in use world-wide. Our latest MetroCount® Traffic Executive (MTE) software, for both the PC and Pocket PC platforms. Provided free with all MetroCount traffic monitoring products, Traffic Executive is the most powerful traffic analysis tool, with many graphs, charts, tables and user-defined options. The MetroCount MC5810 “Advanced Loop Classifier”. The MC5810 length based classification device uses reliable inductive loops to count, classify and measure speeds of each vehicle passing the permanent site/s. Compared with traditional loop devices, we have completely revolutionised the inductive loop interface for accurate speed, timing and volume measurements. The MC5810 also incorporates extensive diagnostics for existing loop installations. The MetroCount MC5805 “Advanced Loop Counter”. The MC5805 traffic counting device uses inductive loops to count passing traffic at permanent locations. 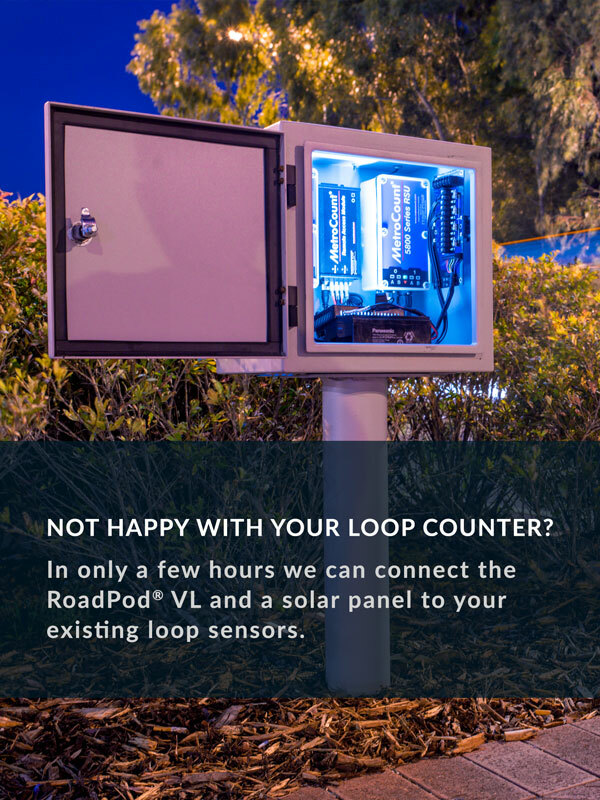 Compared with traditional loop counters, we have completely revolutionised the inductive loop interface for accurate traffic counting. The MC5805 also incorporates extensive diagnostics for existing loop installations. The MetroCount FieldPod “Remote Access System for permanent sites”. For telemetry enabled permanent installations with fully featured wireless 3G remote access, this sophisticated yet ultra-low (battery) powered system will enable remote data delivery via an internet based Remote Access Server to anywhere in the world, complete with status checking and even real-time traffic views. The MetroCount MC5720 “Advanced Bicycle Counter”. The MC5720 bicycle classifier uses embedded Piezo axle sensors to bi-directionally count, classify and measure speeds of bikes at permanent locations. A new technology employed in the sensor interface electronics enables extremely sensitive detection of even slowly moving recreational cycling, whilst rejecting external electromagnetic noise for accurate counting in both directions. The MC5720 also measures speeds of the bicycles to provide comprehensive flow statistics. The MetroCount® 5712 Timing Analyser for Signalised Intersections / Railway Crossings. The 5712 Timing Analysis Unit gives a unique view of traffic signals and railway crossings, to assess their relative safety. Now you can gather detailed vehicle data relative to the traffic signals, and generate reports showing infringements and highlight existing hazards. The MetroCount® 5710 Permanent Roadside Unit supporting 4 piezo sensors. The innovative 5710 Series extends MetroCount’s lead, providing innovative traffic survey solutions for medium to long term studies. With the 5710, MetroCount has revolutionised the use of piezoelectric axles to provide the ultimate in vehicle classification accuracy. The MetroCount® 5740 Piezo Site Evaluation Unit. MetroCount’s 5740 is the world’s only integrated system providing rapid assessment of existing piezoelectric axle sensors. Installed very quickly, you can examine key properties of your piezo installations with detailed diagnostics, and log their performance over an extended period. MetroCount is committed to providing the right traffic survey products, support and software features to private contractors, government agencies and consultants worldwide. We now have clients in over 100 countries worldwide, within Local Government, Departments of Transport and private Engineering Contractors. With our MetroCount Vehicle Classifier Systems you can flexibly and rapidly execute, monitor and report your traffic surveys. Best of all, our MTE software is supplied FREE with any new Roadside Unit!